22 Mar - Members of the Seychelles’ military join training session HMCS Regina's Naval Tactical Operations Group detachment during Op Artemis. 15 March - Crew member from HMCS Shawinigan responds to a simulated fire during Operation Projection West Africa. 14 Mar - Member of 4th Artillery Regiment prepares to test BlackJack, a Small Unmanned Aerial Vehicle at CFB Gagetown in Blissville, New-Brunswick. 9 Feb - CH-148 Cyclone helicopter, RAPTOR, fires off self-defence flares while conducting flying operations during Operation Reassurance. 25 Feb - Able Seaman Edgar Sangalang of HMCS Regina conducts maintenance on the propulsion diesel engine during Operation Projection Asia Pacific. 22 Feb - a CH-146 Griffon helicopter from 439 Combat Support Squadron, Bagotville on exercise Sapin Polaire with members of the Search and Rescue (SAR) team onboard. 22 Feb - Members of Régiment du Saguenay cross Lac-St-Jean during Exercise Sapin Polaire on Lac St-Jean, Québec. 15 Feb - Cdr Martin Fluet and his Command Team greet members of Standing NATO Maritime Group 2 as they board HMCS Toronto in Piraeus, Greece. 21 Feb – NRU Asterix prepares to conduct a Replenishment at Sea with HMCS Regina during Operation Projection in the Pacific Ocean. 24 Feb – LCdr Teri Share, Captain of HMCS Shawinigan presents school staff of with a donation of supplies while at Port in Abidjan, Côte d'Ivoire during Operation Projection West Africa. 6 Feb – CH-148 Cyclone helicopter from HMCS Toronto's Air Detachment flies alongside the ship for flight operations during Operation Reassurance. 5 Feb – Members of Task-Force Mali receive orders in preparation for a patrol during Operation Presence-Mali. For now the U.S. Army has decided not to buy the next variant of the CH-47F Chinook cargo helicopter for the conventional force and a key Army leader has indicated that decision could change down the road while another said there’s no going back. This week, DND released the 2018 Surgeon General Report on Suicide Mortality in the Canadian Armed Forces and VAC published their 2018 Veteran Suicide Mortality Study. Lawyers for Vice-Admiral Mark Norman and the federal government argued Wednesday over the words of Canada's top bureaucrat during the SNC-Lavalin affair as the suspended military officer's team pressed for access to secret government emails and memos. Charles Bouchard today announced his decision to retire as Chief Executive, Lockheed Martin Canada effective 30 April 2019. Federal lawyers have signalled a partial surrender in their fight with Vice-Admiral Mark Norman's lawyers to keep the contents of some federal documents and memos secret during his trial. Boeing has been awarded US$14.3 billion to support and upgrade the B-52 Stratofortress and B-1B Lancer bombers over the next decade. Work will be performed in Oklahoma and is expected to be complete by 11 April 2029. For those who love a man, or woman, in uniform, the Army Ball was the place to be on Saturday night as Canada’s military came dressed in their finest for the black-tie gala held at Gatineau's Hilton Lac-Leamy. The U.S. military is returning to the era of “Don’t Ask, Don’t Tell” policies, said troops and LGBT+ groups, as new rules that will ban most openly transgender people from serving came into effect on Friday. How is Canada modernizing armed forces training? 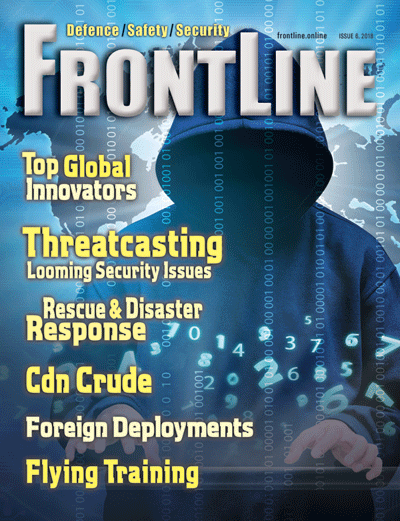 Defence IQ had the opportunity to talk to the Commander of the Canadian Army Doctrine & Training Centre, Major General Stephen Cadden, about the modernization of the Canadian training program and the importance of industry in delivering the right solutions. In an Ottawa courthouse, where daily law-and-order dramas play out before judges, one court proceeding now underway could land on Justin Trudeau’s doorstep just as Canadians get ready to go to the polls. The RCAF’s fleet of C-130J aircraft have been dogged with problems in recent years, once prompting a warning about aircraft availability. There have been problems getting enough parts for the transport aircraft fleet, forcing the RCAF to use wheels and tire assemblies from older Hercules on the new planes. Less than a decade after Israeli Prime Minister Benjamin Netanyahu promised to turn his country into a top-five global cybersecurity power, Israel is recognized worldwide as a cybersecurity innovation hub that continues to produce not only some of the best products and services – but the best minds. Sudan's state-run broadcaster says Defence Minister Awad Mohammed Ibn Auf is being sworn in as head of a new military council that will run the country for two years. The move is being taken after the military ousted autocratic President Omar al-Bashir on Thursday following nearly four months of expanding protests. The Supreme Court of Canada will not delve into the multibillion-dollar sale of Canadian-made light armoured vehicles to Saudi Arabia. The high court gave no reason for refusing to hear an appeal from University of Montreal law professor Daniel Turp, who has pursued the issue for years. Boarding team from HMCS Regina has seized 2,569 kilograms of hashish while deployed in the Indian Ocean as part of Operation Artemis, which is Canada's contribution to counter-terrorism and maritime security operations in Middle Eastern and East African waters. As the 75th anniversary of D-Day approaches, I ponder what impact this event has, and will continue to have on Canadian society. A list of recent leadership changes in industry and government: CarteNav Solutions; Raytheon Integrated Defense; ADGA Group; David Pratt & Associates; Business Council of Canada; Ultra Electronics (Maritime Systems); BC Ferries; Fleetway Inc; JRB Kanata Group; Ashbury College; Scotiabank; Canadian International Council; AIAC; Royal Roads University. The evolution of the role of fighters is at the center of the shift to recraft combat capabilities and operations as operational contexts change. Foreign Deployments – Is there a strategy? At first glance, Canada’s current overseas military deployments may appear rather haphazard with troops situated in relatively small numbers across thousands of miles. However, when the missions are collectively examined, a strategy becomes clear. Submarine Force has had a busy year in 2018 – in particular, it two highly successful, simultaneous, out-of-area deployments. Two years ago, VAdm Mark Norman was temporarily relieved as VCDS. His lawyer, Marie Henein, is revved up for a showdown in court, but may have difficulty getting access to classified documents needed to defend her client. CAE-built flight training devices for ground school training are currently being upgraded by CAE to enable additional NFTC simulator training. The Military Flying Training System (MFTS), a contract that facilitates the Ministry of Defence (MOD) in preparing aircrews for eventual assignment to frontline squadrons, is operated by Lockheed Martin and Babcock International, using Airbus helicopters.